Class up your glassware cabinet with this righteous Devil Wears Parsley pint glass set of 4! Custom etched by a local artisan in Temecula, CA, the graphic will never wash away or fade – it's become a part of the glass itself! 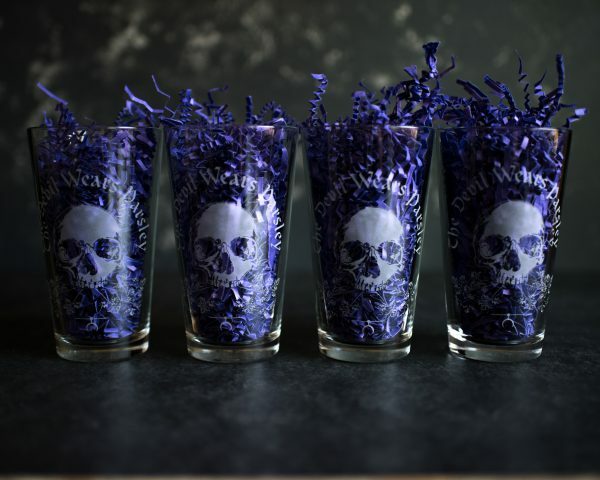 Class up your collection with this custom set of Devil Wears Parsley pint glasses! This bad boy is the perfect all purpose glass to suit all of your hydration and imbibing needs. 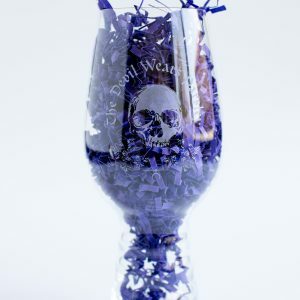 While a pint glass is generally thought of as a beer glass, it dresses up cocktails with ease, and is a favorite all-around water glass! 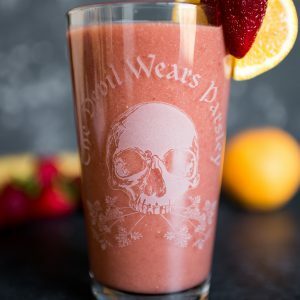 This durable glassware is custom etched by an artisan in Temecula, California, so the design will never fade on you as with other, printed pint glasses. Since each glass is sand-blasted by hand, variances in design may occur. Perfect for stacking. This is a durable Libbey Pint Glass. Dishwasher safe, and the design will never fade!